Check out our Photo Gallery for more photos! 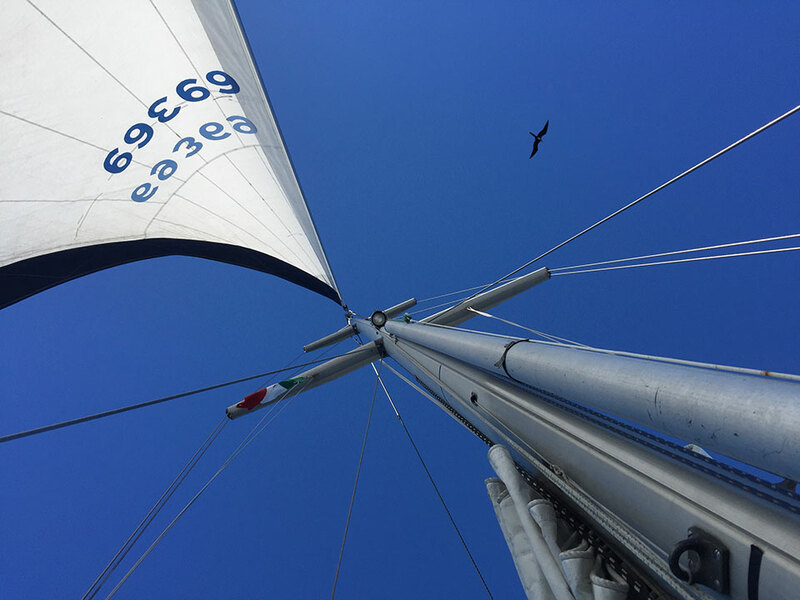 When we last left you we were enjoying a Thanksgiving Holiday with our Giswold Family in Los Barriles, where we invited Sara to join us for a sailing adventure anytime she'd like. Since the wind hadn't been cooperating for her windsurfing lately, and Sara is always game for adventure (like the time she joined Kirk and friends for a bicycle-camping tour of the Chateau filled Loire Valley in the mid 1970's when she was several months pregnant! 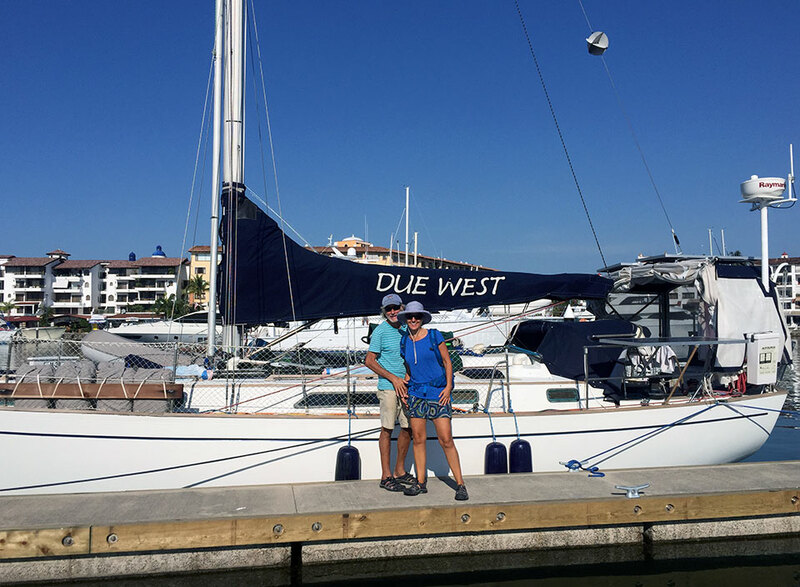 ), she took us up on the offer and decided to do her first off-shore crossing from La Paz to Banderas Bay/Puerto Vallarta with us. For those of you who don't know Sara, her husband was the late-great Dr. Bob, Kirk's best friend since age 11, who sadly left us way too soon last year no thanks to cancer. We have spent many a Thanksgiving, Christmas, and vacation with Bob and Sara, and we were so excited to have Sara join us for this new adventure! We were delayed leaving La Paz for this 3-day long crossing by almost a week waiting for the right weather window, and for Kirk to get over a cold/flu bug. Meanwhile Sara's girlfriends from Los Barriles were on call to drive her up to La Paz as soon as we said "Go!" We finally got our weather window to go, and said good bye to all of our La Paz friends, cruisers, and Marina de La Paz staff. We MISS you Martha!! Sara and her girlfriends arrived the day before to help provision and get settled into boat-life with two cats. Not having had pets for many years, Sara was a great sport about having kitties running all over her bed and across her head ~ And Tosh and Tikka were thrilled to have a new playmate! 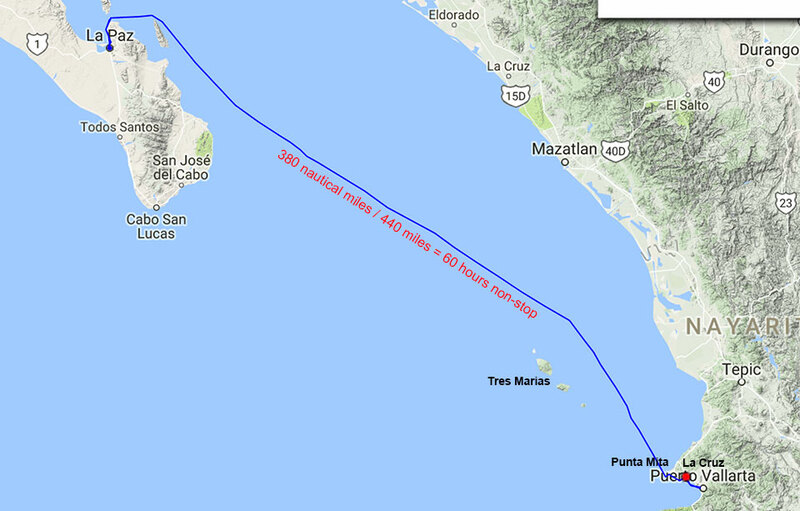 Our 380 nautical mile passage from La Paz to Banderas Bay took 60 hours from hook up to hook down. If you're wondering about the jog in our course, we had to give the Islas Tres Marias a wide berth as there is a prison on one of them and Mexican Navy patrols the waters ensuring that boaters keep a fair distance. We stayed 20-miles away which you can see in our course change to the northeast of the islands. We crossed with our friends Viviane & Scott and Gato-Sam on s/v Juniper, but after the first few hours we lost visual contact with them. So we set up an SSB radio schedule and checked in with each other every evening, and again on the Amigo Net in the mornings. We are still Net Hosts on the Amigo Net at 1400 Zulu two days a week: Heidi on Mondays, and Kirk on Tuesdays on frequency 4.149USB. If you have an SSB and are in Mexico, please check in--we'd love to hear from you! We actually had enough wind to sail for about 4-5 hours sans-motor, which was very nice! And with the calmer seas the wildlife sightings were amazing on this trip! We saw 10-12 endangered Olive Ridley Sea Turtles while sailing across the Sea of Cortez from La Paz to Puerto Vallarta, and used the iNature App to track them as Citizen Scientists for "Project Sea Turtle" scientific research. When the seas are flat-calm you could easily spot large brown "blobs" on the surface of the water, which turned out to be sea turtles! Photo ©oliveridleyproject.org. Cool Animal Sightings: Just after leaving La Paz area, Sara and Heidi saw a bright turquoise blue-green Dorado (Mahi Mahi) leaping through the waves behind Due West. Too bad, no hook out... lucky fish! We also enjoyed our visit by a pod of about 12-15 pantropical spotted dolphins one morning as they danced on our bow wake for five or ten minutes, LOVED that! And we spotted many (10+) endangered Olive Ridley Sea Turtles in the flat-calm water. Made us wonder how many we've missed seeing when there's just a slight chop on the water, since these were easy to spot floating or swimming in the flat calm. We are also participating in a COOL Citizen Science project via iNaturalist.org and the iNaturalist App. There are lots of different projects where you can sign-up to help scientists track and study wildlife. We joined the "Sea Turtle Spotter" project and tracked lat/long coordinates of all the sea turtles we saw, to submit via the app. Then the COOLEST animal(s) we saw were just as we arrived in Banderas Bay three days after leaving La Paz. Sara spotted a whale spout, and we soon came upon a Humpback whale cow and calf...So beautiful to see, none of us had ever seen a calf in person before, very lucky! We were so in awe we all forgot to snap a photo! An other unusual encounter at sea occurred on our third day out, 60-miles from the nearest shore, mid-day while Heidi was off-watch asleep. Kirk and Sara we on watch but Kirk had just gone down below to check the water maker. Suddenly Sara called out "Kirk, you'd better come up here!" That woke Heidi up and both of us bolted into the cockpit. Right in front of us, literally about a boat's length away, was a panga with two fishermen and a long net. Kirk quickly disengaged the autopilot and steered hard to port, to avoid hitting them, then threw the boat into neutral as we floated over their net. Thankfully no harm done to boats or net. Kirk and Sara had seen the panga a long ways away, and we "think" they suddenly zoomed over to protecter their net, not realizing they literally put themselves directly in front of a moving vessel. BIG THANKS to Kirk's quick acting helmsmanship that those fishermen and their boat were ok, and us too! That got everyone's adrenaline pumping! Hopefully they won't be zooming in front of a moving vessel again anytime soon! Oh, and the fiberglass fishing pangs? They don't show up on radar AT ALL, just glad it was broad daylight not middle of the night. We know several boats whose propellers, keels, and rudders have been entangled in fish nets...we were VERY lucky this time. 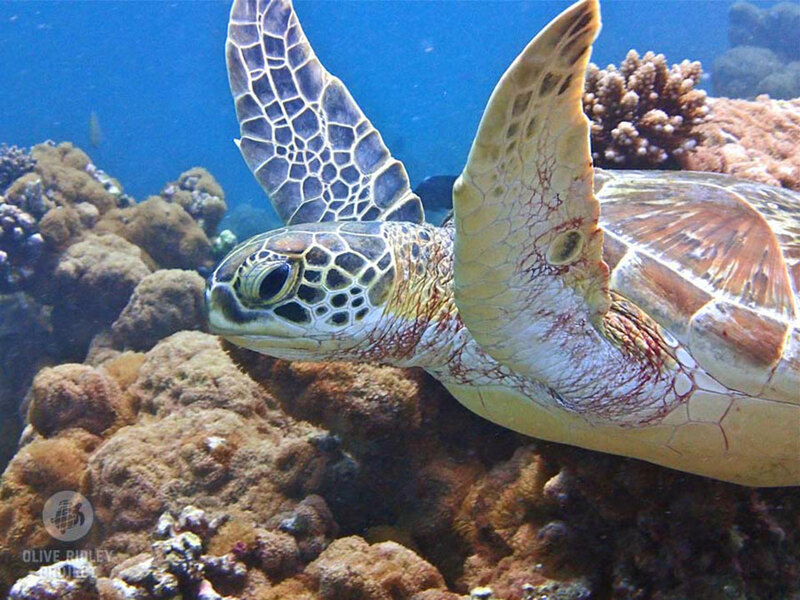 When you see a fishing buoy, it's hard to know what to do, where the net may or may not go, if its a continuous line, a crab or shrimp pot, or more often just an abandoned net...these abandoned nets can also entrap sea turtles, dolphins, and whales. On night watches you're just going with hope and faith that we won't snag anything. And if we do get snagged, we have scuba gear, diving lights, and dive knives so could go down and cut it all off, but that would not be fun, and could be dangerous in big seas or at night. If that ever happened at night, we would most likely heave-to (back-wind the sails and float around) until daylight before attempting to dive the boat and cut ourselves free. 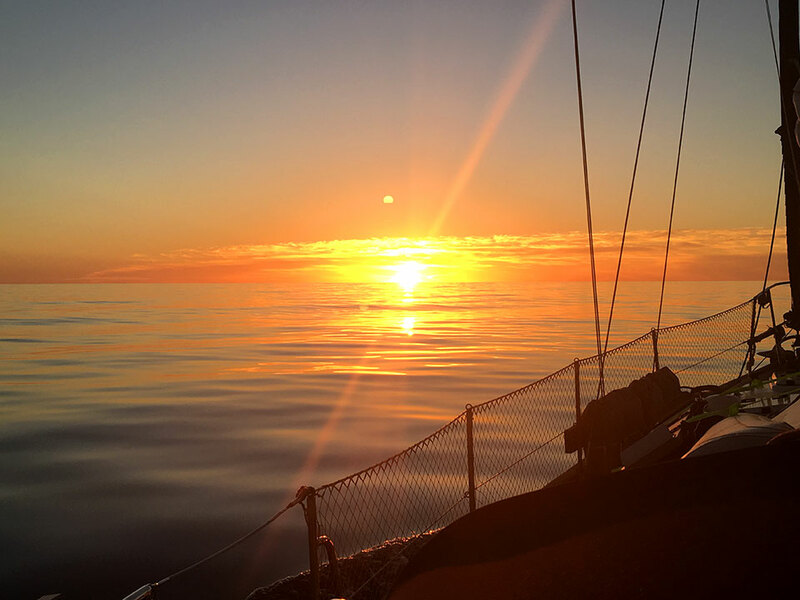 Sunrise at Sea...the reward for an all-night watch. Besides being a fantastic cook, Sara is also a very creative with arts and crafts, and brought along materials so she and Heidi could make Origami stars to decorate the boat for the holidays. Tosh and Tikka thought it was great fun to help too! And Sara brought her water colors and painted some nice scenes along the way. 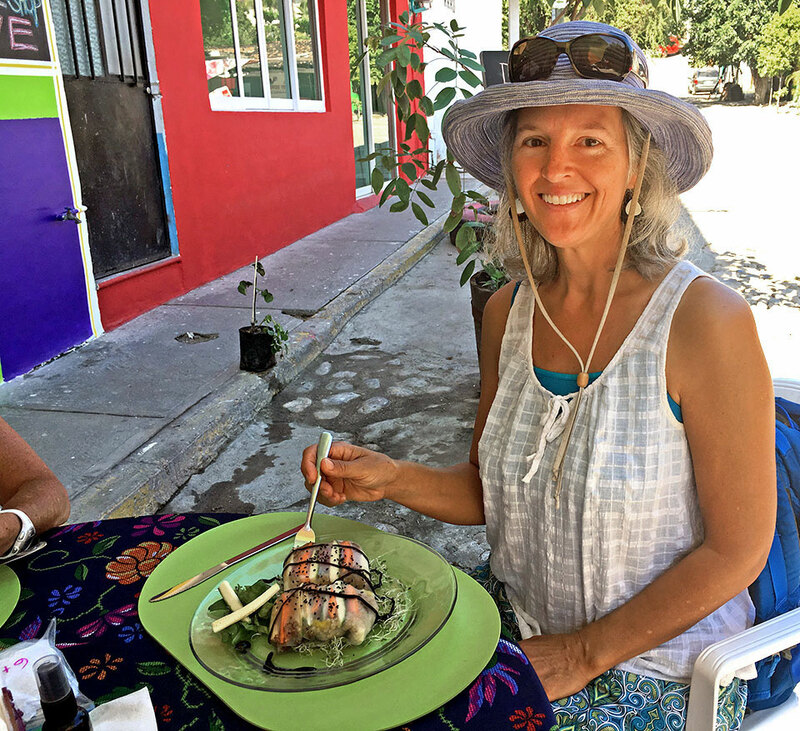 Although she has spent the past 25-years wind surfing in Baja, Sara had never been to mainland Mexico before and we were excited to show her around. If you've only been to Baja, mainland Mexico is very different, lush, and green. We made landfall at Punta de Mita, on the northern tip of Banderas Bay (just south of Sayulita) at 21:30 (9:30pm) on our third day at sea. Dropped the hook (anchor), and hit the hay for a nice long night's sleep. Next morning we made our way the short distance east to La Cruz and that's where we encountered the magical Humpback cow and calf. 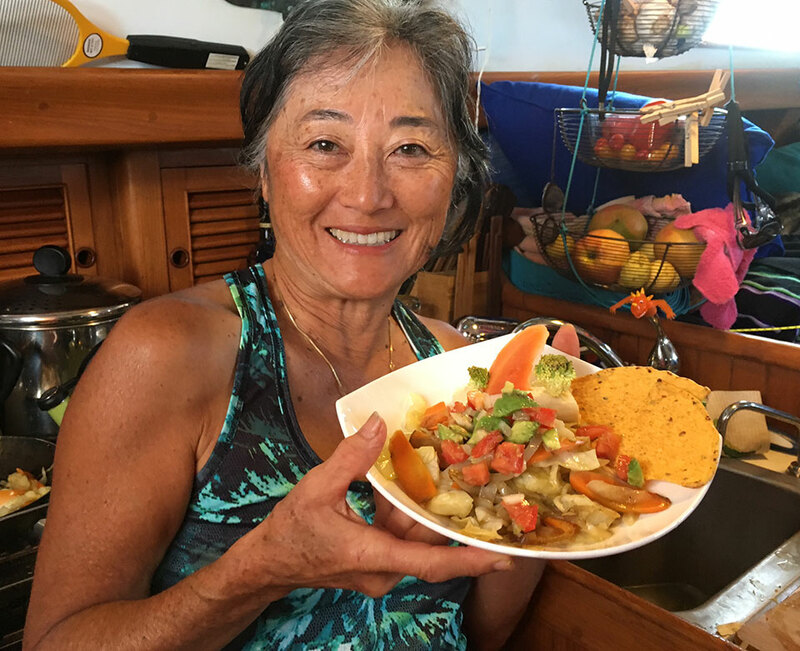 Hook down in La Cruz anchorage and it was like old home week again, meeting back up with Viviane & Scott on s/v Juniper, and running into friends Peg & Tony on s/v Mambo, and Judy & Fred on s/v Wings. As luck would have it, we arrived just in time for the Sailors Splash Party to welcome back all the cruisers for the winter season in La Cruz. A FUN evening of food and drinks with a live band entertaining everyone along the La Cruz malecón. 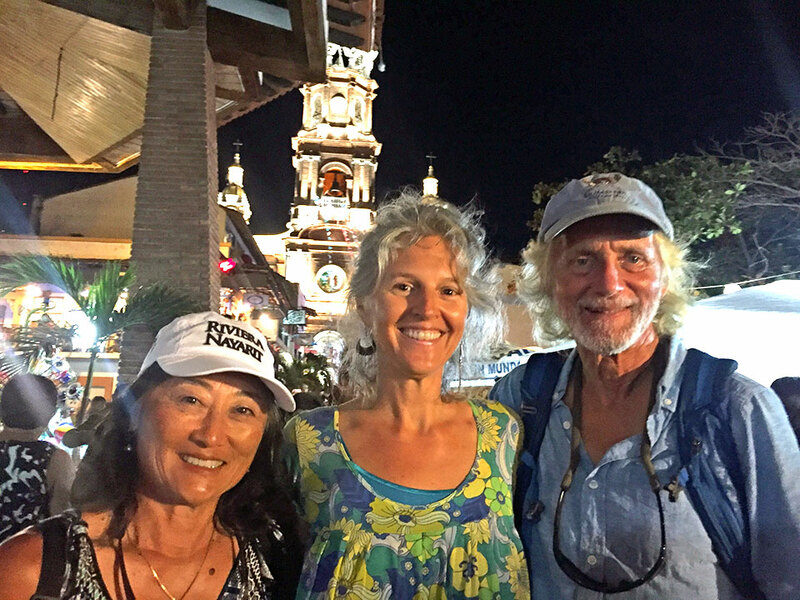 Plus a great small-world encounter with our Seattle "Pirate Girl" friend and marina-mate Michele from s/v Tsunami who happened to be in Banderas Bay on a sailing vacation! 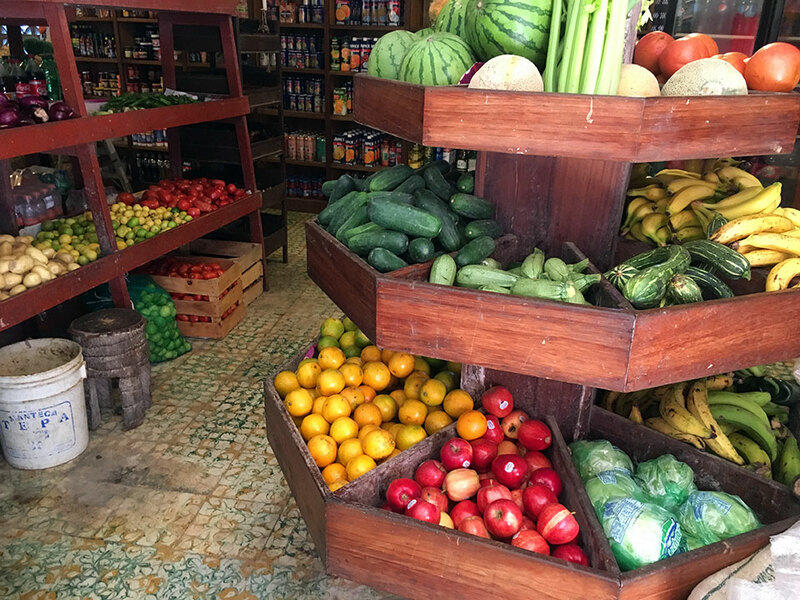 Organic Love in La Cruz offers vegan/gluten-free deliciousness prepared with love by the proprietress Alef, including a Chocolate Smoothie to die for: frozen banana, cocoa powder, coconut milk and coconut flakes. That's it, blend up and...Ummmm....HEAVEN...Going back for more! 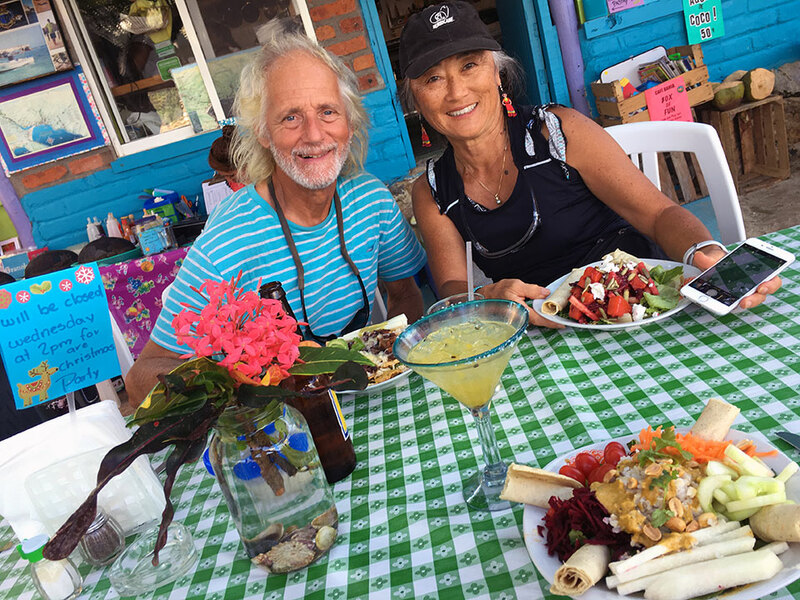 But before exploring Puerto Vallarta we took a quick trip back to La Cruz with Seattle sailing friends Judy & Paul (s/v Grace) who've now moved to PV full-time. They picked us up at Marina Vallarta on Sunday morning to drive us back to the La Cruz Sunday Market (see our previous blog post on La Cruz & Sayulita.) We wanted to be sure Sara got to see some of the beautiful Huichol artwork available here, oh, and Sara and Heidi had to buy new sundresses too! There is also great food at the La Cruz Sunday market and we sampled hibiscus flower tacos and a giant pizza-sized open-faced taco from Oaxaca with veggies and cocoa-banana molé sauce, YUM! But we declined the cricket topping which apparently is a Oaxacan delicacy, maybe next time? 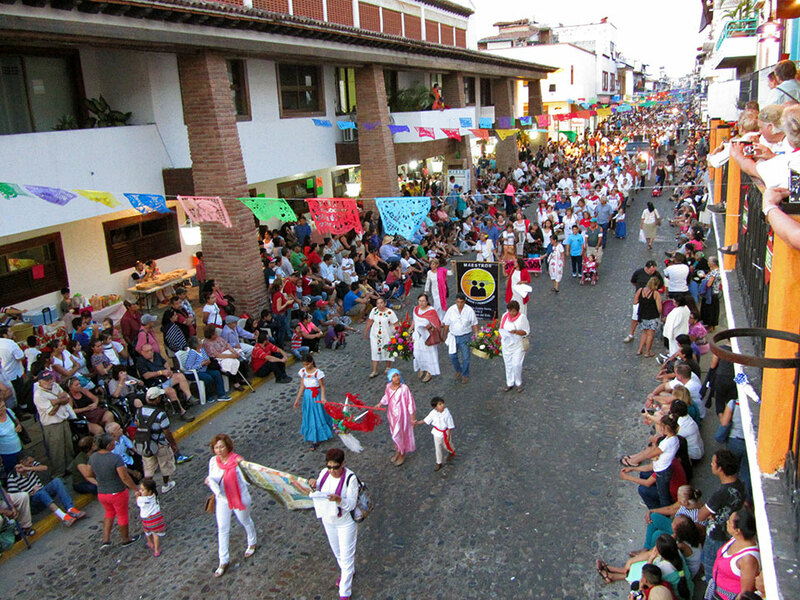 The Festival of Guadalupe runs December 1st-12th in all night celebrations, parades, and fireworks as pilgrims make their way to the Cathedral of Guadalupe, near Old Town, Puerto Vallarta, culminating on December 12. Monday afternoon, December 12 it was finally time for us to experience the Festival of Guadalupe first hand. Judy & Paul had talked it up for months and it sounded like fun, so we planned to attend the festivities many months ago and were pleasantly surprised that for once our "schedule" worked out to be somewhere when we planned! We took the bus from Judy & Paul's waterfront condo to el Centro (downtown) as far as it could go until the bus hit gridlock from the festivities, then we walked the rest of the way along the Malecón, taking in all of the eclectic, surrealistic sculptures along the way, and all of the people in festive attire. Thousands of people make the pilgrimage to Festival of Guadalupe every year, many of them on their knees as they enter the church, like these two. 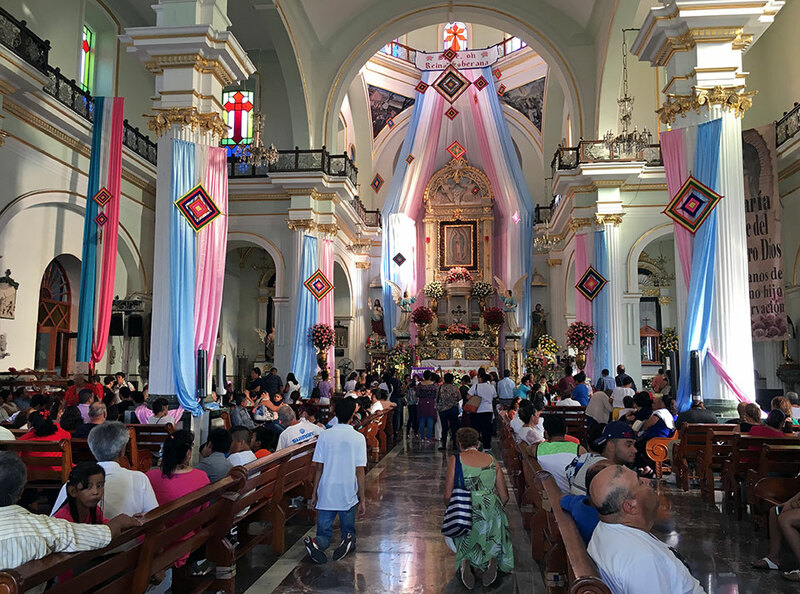 Known in Spanish as Dia de Nuestra Señora de Guadalupe, this important religious and social festival commemorates the miraculous appearance of the Virgin of Guadalupe to a peasant in Mexico in 1531 AD. December 12th is the grand culmination and the largest number of pilgrims arriving at La Iglesia de Nuestra Senora de Guadalupe (Cathedral of Guadalupe) in parade-like fashion, including floats, dancers, fireworks, the Navy, and even the local pro soccer team, singing, dancing, theatrics and more. Judy & Paul knew the best vantage point to watch from as they grabbed us a balcony corner table in an upstairs restaurant a block from the church where we had a fantastic view of all the festivities with margaritas in hand. Our table was to the far right of the above photo, by the yellow railing. Below Judy & Paul enjoying their margs! Table secured by Judy & Paul, the rest of us walked through the church and then back to the restaurant to watch, drink, and eat...Viviane and Scott joined us for the festivities too! We arrived at around 1600 (4pm) and by the time we left around 2200 (10pm) there were still thousands of people in the street and more pilgrims making their way to the church. The church bells were ringing and the fireworks were popping and cracking and booming all night long. Tons of food vendors in the street and everyone having the time of their life. We hope to be back again for next Dec. 12. 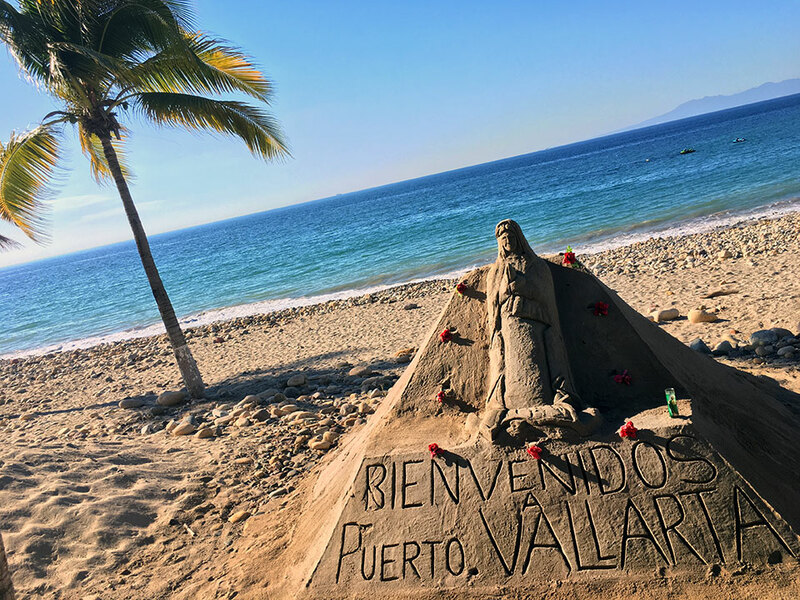 If you're ever in the Puerto Vallarta area in early December, don't miss it! We took a quick cab ride back to the marina as the busses were all still mired down in pilgrims. A fantastic evening, BIG THANKS Judy and Paul for introducing us to the Festival of Guadalupe! The church was beautiful at night, with fireworks shooting off overhead, and revelers in the street. 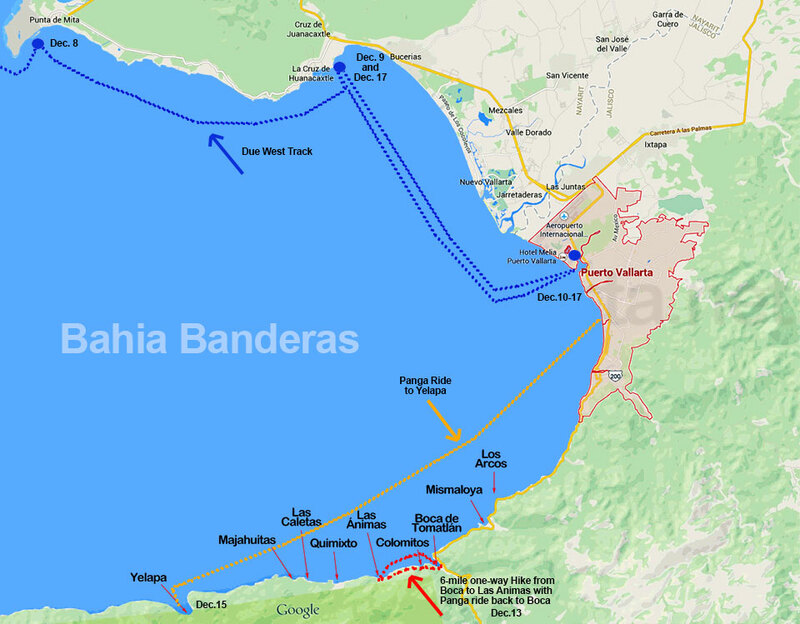 Map of Banderas Bay, showing Due West's route from Punta de Mita to La Cruz to Puerto Vallarta and back to La Cruz (blue track), plus our hike along the the south coast of Banderas Bay (red track), and our panga ride route to Yelapa and back (gold track.) Banderas Bay has about 60-miles of coastline, is about 30-miles wide, and 3,000 feet deep as it's part of a trench-system offshore of Mexico. Yelapa beach and bay full of pangas. 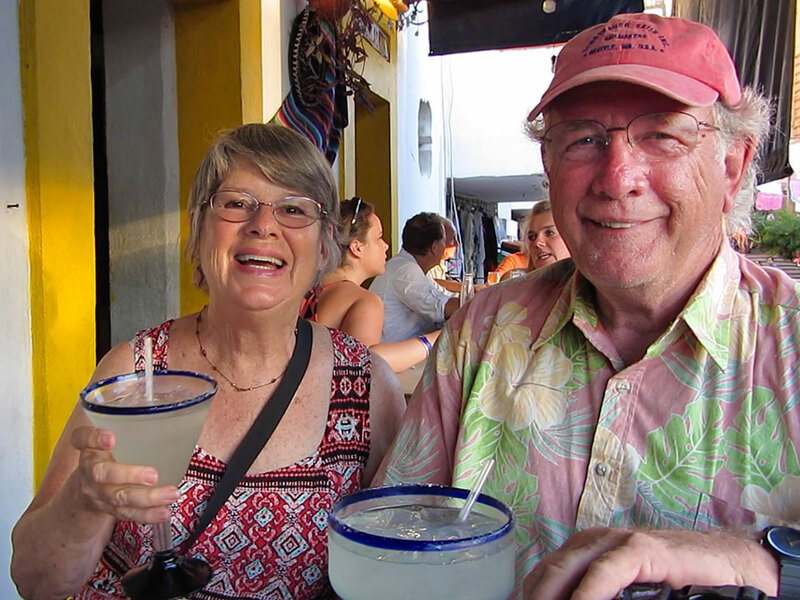 Wednesday we bussed back into Old Town Puerto Vallarta with Sara, Viviane & Scott, and took a 45-minute panga ride to Yelapa, on the southwestern coast of Banderas Bay. 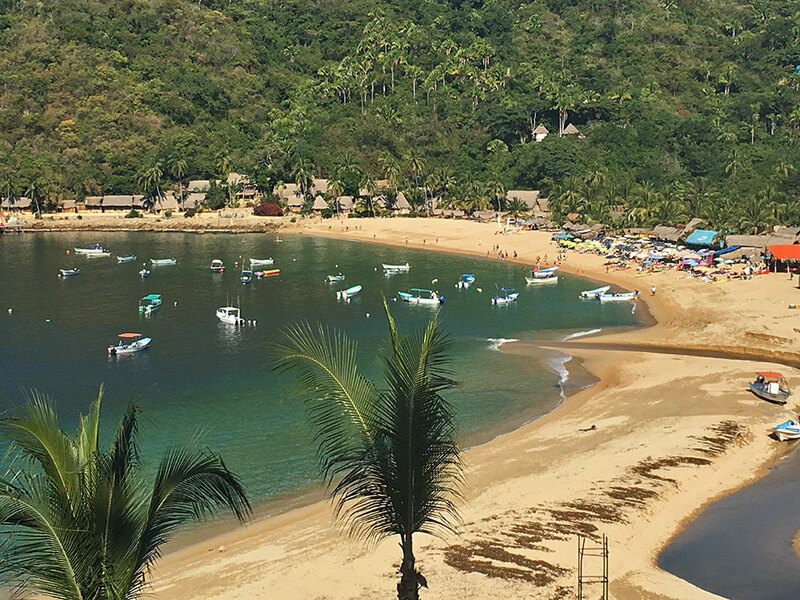 A visit to Banderas Bay isn't complete with out a trip to Yelapa and it had long been on our to-do list. With Sara here it was the perfect time to go and Viviane and Scott were eager to join us too. We could have sailed to Yelapa but the water is very deep requiring a LOT of scope (chain) for your anchor, plus the holding isn't great and it's a small bay full of fishing pangas so we'd been advised by other cruisers that it's easier and more fun to just take the panga there and not worry about your own boat the whole time you're ashore. Plus with the panga ride we got a guided tour through the cute little town of Yelapa and up to the waterfall. Kirk and Sara with our delicious lunch at Cafe Bahia in Yelapa. There are no roads to Yelapa and no cars--the "streets" are narrow cobblestone pathways just wide enough for burros, mules, horses and people. There are a now a few ATVs which are a tight squeeze on some paths and other paths they can't access at all. 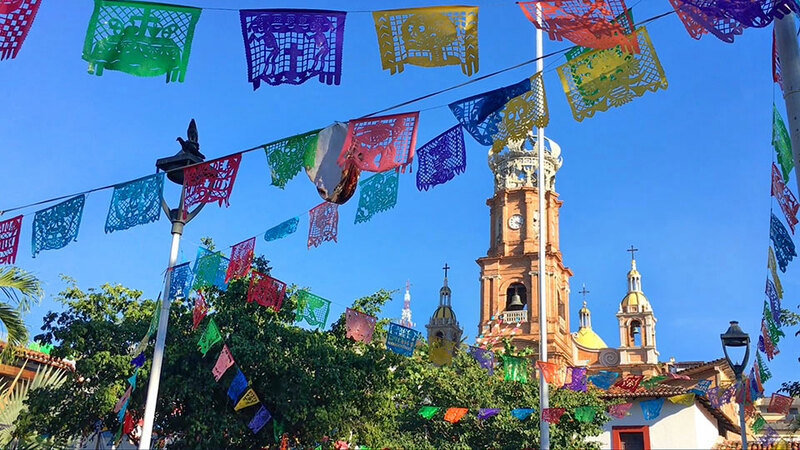 Although we hear it's much more "grown-up" and more "touristy" than it used to be, (and we have friends who won't visit it anymore because it's "ruined"), we thoroughly enjoyed our visit to this quaint Mexican village and were happy to spend a few pesos to help their local economy. We even plan to go back again by panga and do the longer hike to the other waterfall! Produce market in Yelapa where everything is brought in by panga boat, no roads here. 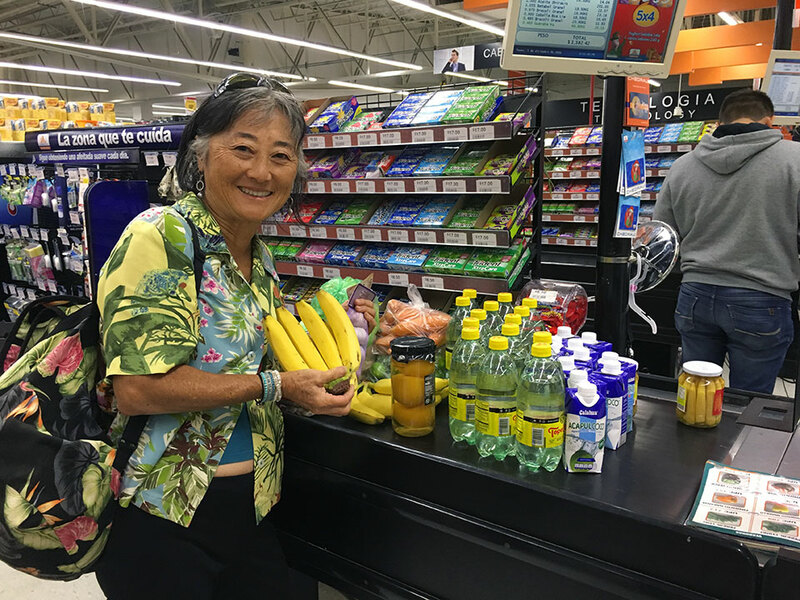 We were jonesing for a Costco run to stock up on nuts (a main source of protein for us, and Costco has a great supply which can be hard to find in Mexico). So Thursday morning Judy and Paul offered to pick us up and take us to the Puerto Vallarta Costco in their SUV. Judy even sussed-out a small Organic Natural Food Market in their neighborhood where we loaded up on dark chocolate and local bee pollen. 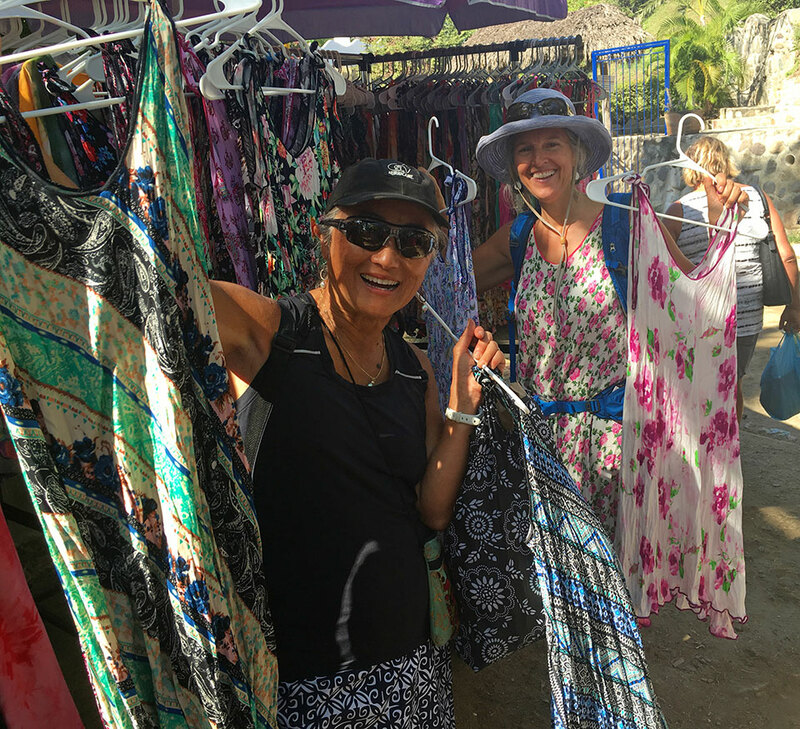 We returned to Marina Vallarta in time for their Thursday night Artisan Market all along the Marina Malecón, where we were pleasantly surprised by the quantity and caliber of the artisans and their wares. Lots of artists painting and creating art as we watched ranging from a wide variety of local Huchiol artists to wood carvings, jewelry, weaving, and everything in-between. We all got lots of unique Holiday shopping done at extremely reasonable prices! 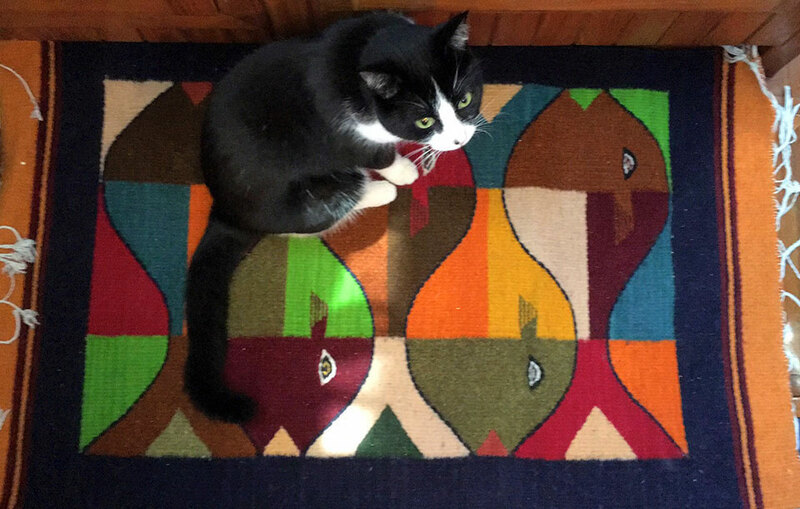 Tikka (and Tosh) LOVE our new hand-woven Escher-esq galley rug. Merry Christmas to Due West! It was too good a deal to pass up and it really helps liven up the galley too. All too soon it was time for Sara to leave us and fly back home to Baja (and then on to Whidbey Island for Christmas with her family). We were up early Friday morning to see Sara off to the airport, and get ourselves ready to head back to the La Cruz anchorage and meet up with lots of cruising friends here. We had hoped to make it to Bara de Navidad for Christmas, but most of our friends were scattered in different directions north in the Sea and would be lucky to make it to La Cruz by Christmas let alone Bara. So we opted to stay around Banderas Bay and meet up with friends here and hopefully we'll all sail south soon after the holidays. In spite of Hurricanes and a few other equipment issues, we've been extremely lucky this past year all things considered, and have had a WONDERFUL first year of cruising. We wish you and your families a Happy Holiday Season, and health and happiness in the new year. Thanks for reading our blog and sharing with your friends and families too. We are thrilled by how well our blog has been received and really enjoy putting it together for all of you! If you're new to cruising or planning to cruise please feel free to reach out to us, we're happy to share what we've learned. Merry Christmas, Happy Chanukah, Happy New Year...And PEACE on Earth goodwill to ALL, we're really gonna need it this next year! Remember to check out our Photo Gallery for more photos!